Ever since the first arrival of a female Panda in Berlin approximately 20 year, ago named “Yan Yan” at the Berlin Zoo, residents of Berlin were enthusiastic and welcoming of this animal in their city. For one of the first times in history, Berlin was soon to have a population of Panda cubs with Yan Yan being female and able to reproduce. However before that could occur, Yan Yan had passed on and wasn’t able to fulfill the legacy that the city has initially hoped for. “But what do we really know about this blackandwhite bear that seems to be constantly munching away on bamboo and becoming ever more popular in the process? “ This is the objective question that has risen from the curators working within the exhibition, ‘Panda’ at the Museum für Naturkunde in Berlin, Germany. The Museum für Naturkunde is one of the largest natural history museums in Germany. Having the exhibition of the ‘Panda’, not only piques interest for others who come from all over the world to view the skeletons of creatures who have lived many years ago, but it points the questions and has an informative approach of the Panda itself and the threats that this animal is faced with in present day. The exhibition is organized by the different roles the Panda plays in the world today.From the cultural icon that is represents and its place in history, to its habitat what it eats, where they live, the anatomy, ways that organization such as WWF, Wildlife Research, Zoo Berlin has researched its protection, their offspring and their way of reproduction, and ultimately the final conundrum: its threat for extinction today. 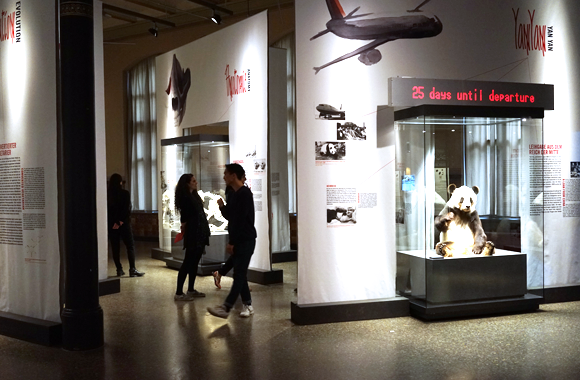 With Yan Yan actually being in the beginning of the exhibition, it allows you to move through the space smoothly with digesting each bit of information and the Panda’s relevance. 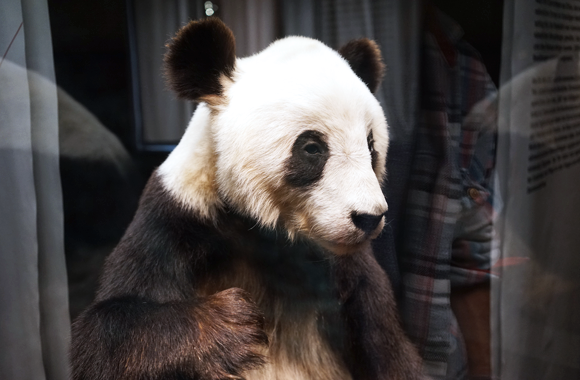 From having the actual taxidermy panda babies, to the food that they eat, bamboo in the space, it allows the viewer to see the objects in real life, (as close as one can behind a piece of glass), and to see the scale and the color, texture, of the objects themselves. I think this is useful for the audience because it gives them a point of reference to have a visual instead of reading wall texts. The exhibit, ‘Panda’, is most definitely worth a second visit. Although the exhibition is well laid out and gives you just enough information the first time so you aren’t overloaded, it’s crucial to raise awareness to not only you as an individual but to others as well. By showing colleagues, family members, children this exhibition is can provide a level of knowledge that perhaps allows others to be able to actively take control of the situation and provide solutions in years to come.